Travelers are a unique bunch. We value experiences over possessions, which can make us difficult to shop for. But sometimes, we need a little luxury in our life to make our time abroad more convenient. I have compiled a list of some of my favorite travel products to help you shop for your favorite traveler, or for yourself! As a travel writer, it is crucial for me to stay connected to my audience on social media while traveling. SkyRoam has been a life-changing device for me. This compact lightweight device provides you with a global hotspot to access the internet on your phone and computer from nearly anywhere on the planet with only a phone signal. SkyRoam has the ability to connect up to 4 devices, although I don’t suggest giving your password to friends because you won’t be able to get them to log off your device and it can bog down your connection speed. I have had excellent luck with the battery as well, as one charge lasts an entire day of instagramming, facebooking and uploading photos! A must-have for the world traveler looking to stay connected off the beaten path. Globetrotters need to know what time it is when traveling from city to city. Often times train and flight schedules are on a 24 hour clock, and even though the conversion is quite simple, jet-lagged brains often need a bit of help. This is why a watch with a 24 hour clock is helpful while abroad. I love Victorinox Swiss Army’s watches. They are well made with a timeless design. The sapphire crystal glass combined with a solid steel frame will last a lifetime if cared for properly. My favorite watch is the Alliance because of the 24 hour clock on the face. It makes converting 12-24 hour clocks easy and keeps me on schedule no matter where I am in the world. Even if you still use your phone to check the time, it looks great on the wrist! While at the World Travel Goods show earlier this year, I was searching the convention for new and innovative products to test throughout the year. One of my favorite new inventions was the MagBag which is a great product for traveling with jewelry. MagBag is a zippered case that looks like a women's clutch. With a patented magnet system inside the case, jewelry stays put by being compressed in between the magnetic system. Small delicate necklaces and earrings no longer become tangled while traveling, as contents stay in the exact location they are placed. MagBag is a game changer! I use an incredibly discreet camera bag to stash all of my gear. The Claremont from Lo & Son’s looks more like a purse than a camera bag. In some places, I can’t leave my purse to get it out of the shot for fear it may be stolen. This way, an ugly camera bag doesn’t ruin otherwise great candid shots, instead, it adds to them. The Claremont also provides greater safety from creeps looking to prey on travelers, since it doesn’t look like a camera bag and prevents me from looking like a tourist. It also makes me less of a target for theft since you would never guess that I have a a lot of expensive camera equipment on me. Do you wonder how some photographers are getting those over/underwater photos? A dome over the camera lens is required for catching those unique shots. The Knekt GoPro Dome and Trigger for the GoPro Hero 3 & 4 is one of the best travel accessories for an adventurous traveler. It is compact for easy packing and easy to use. The Knekt Dome has been one of my favorite travel accessories in 2016 and would be the ultimate gift for your favorite GoPro loving traveler. 2016 has been the year of drone photography! As a travel professional, I have had the luxury of checking out many drones this year while on press trips with photographers and videographers all over the world. The favorite among industry professionals is the DJI Phantom 4. The Phantom 4 will allow your favorite traveler to step up their instagram game, and capture professional aerial photography and videography. 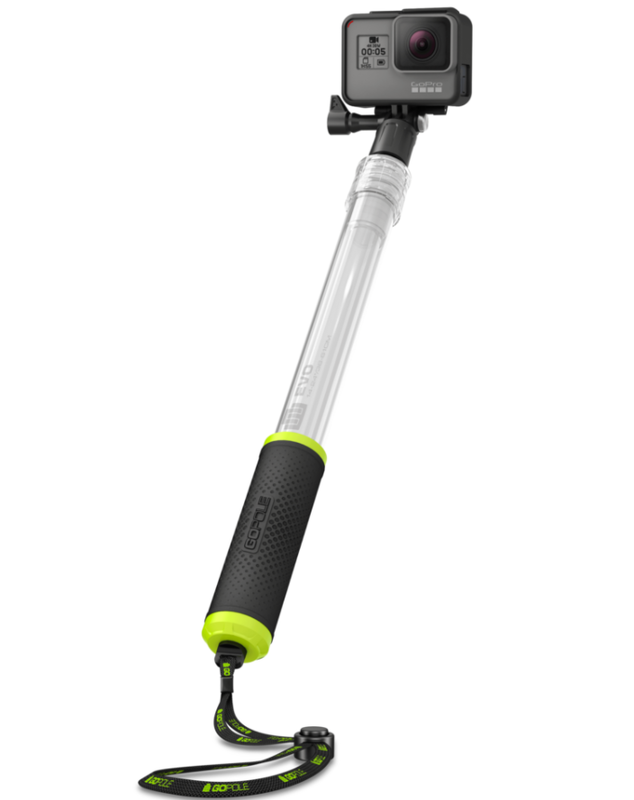 GoPole makes the ultimate selfie's sticks for GoPro users. I love the Evo because it's transparent it is seemingly invisible in selfies. It's especially perfect for divers and water sports enthusiasts because the GoPole Evo floats. It also has a wi-fi remote clip so that you can control the camera from your finger tips. GoPole Evo also includes a wrist strap attachment to ensure that you and your selfie-stick never separate. Additionally, GoPole has a great instagram account to inspire you to use your GoPole and GoPro on your next adventures!